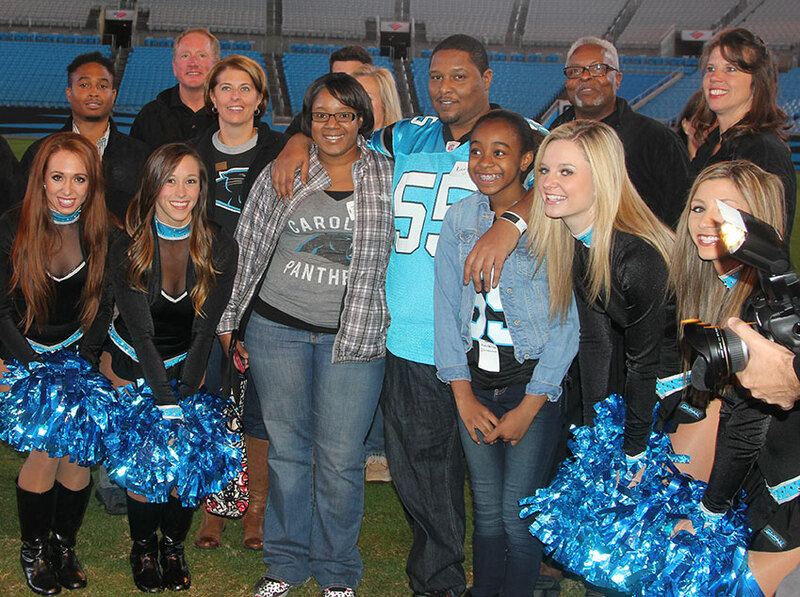 It was a Panthers fan dream-come-true on November 8, for the lucky winners of Allen Tate’s Prowl the Den contest. From enjoying a tailgate party, to sneaking a peak at their favorite player’s locker, to running onto the field while being cheered on by the Top Cats, these fans received some extra special “insider” treatment. The Prowl the Den contest was the latest in a series of Allen Tate promotions to celebrate their 8-year partnership with the Carolina Panthers. Fans registered online to win a guided, open house tour of the Panthers’ facilities and Bank of America Stadium. Shannon Dillahunt, a Panthers fan from Charlotte, N.C., was selected as the Grand Prize winner – receiving four suite tickets and four field passes for the December 21, 2014 home game vs. Cleveland and four replica Carolina Panthers jerseys. “I was in disbelief when I heard my name called. I couldn’t believe I won the grand prize because I’ve never won anything before,” said Dillahunt, who said her favorite part of the tour was seeing the players’ locker room. She will take her boyfriend Eddie Vasquez and daughter Mackenzie, who attended the tour, to the December game, along with her father, Levi Dillahunt. Julie Drejka, Fort Mill, S.C.
Bobbie Furr, China Grove, N.C.
Jonathan Hayes, Moravian Falls, N.C.
Celeste Jackson, Laurel Hill, N.C.
Hunter Whetzel, Pleasant Garden, N.C. Thank you for your feedback, Caleb. Of the more than 11,000 entries received for the contest, 25 winners were randomly selected. Those winners were from cities and towns across the Charlotte, Triad, Triangle and Upstate South Carolina regions and beyond. We appreciate your participation and invite you to register for future Allen Tate contests. I truly appreciate that Allen Tate took the time to notify all entrants of the conclusion of the contest. I don’t often enter contests, in part because I seldom hear anything after the “we got your entry”. I sometimes wondered if anybody ACTUALLY won…?? Thank you for your comment, Brenda. We encourage you to register again next year for a chance to win.